We repair, replace and reposition frame ornamentation and decoration. We are skilled in carving, plaster casting and traditional composition ornament making. We create custom moulds to replicate ornamentation and have an extensive and unique collection of antique timber moulds to create replica ornaments and designs. We offer oil-gilding, water-gilding and ‘mixion’ gilding services and specialise in gilding repairs and in-fills. We use a variety of gold leaf carats, white gold, silver and palladium leaf, as well as Dutch metal to achieve high-quality ad appropriate finishes. We also perform bronze-powder and burnished bronze repairs. We consolidate and strengthen delicate, damaged and flaking surfaces, including faux-finished timber finishes, tempera finishes, gilding, gesso finishes, gravel and sand finishes. 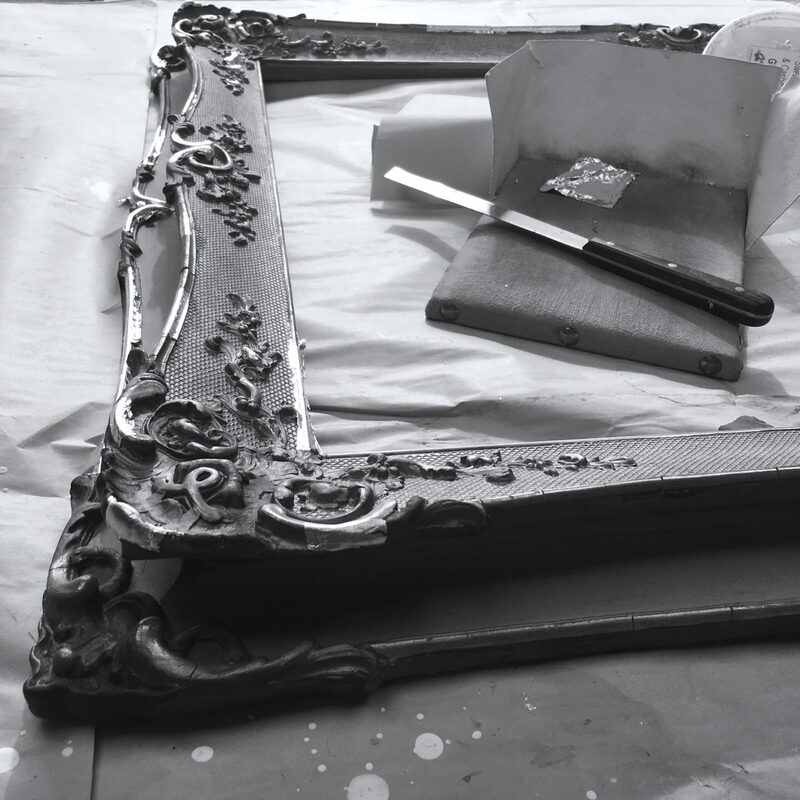 We have knowledge in frame conservation and can offer advice and guidance on appropriate frame restoration, treatment, storage and display to protect the integrity and value of your frames. We secure unstable and damaged frame mitres, repair damaged timber backing and assist in the reduction of timber warping. We build structures to stabilise extensively damaged frames and have experience in using corner blocks and straps for the back of damaged frames. We also build custom frame hanging systems and treat borer and other insect infestations. We clean frames that have been tarnished by dirt, grime and ash accrued over time or from environmental exposure. We can significantly reduce or remove darkened areas and marks on frames and slips, including those marks on gilt surfaces. 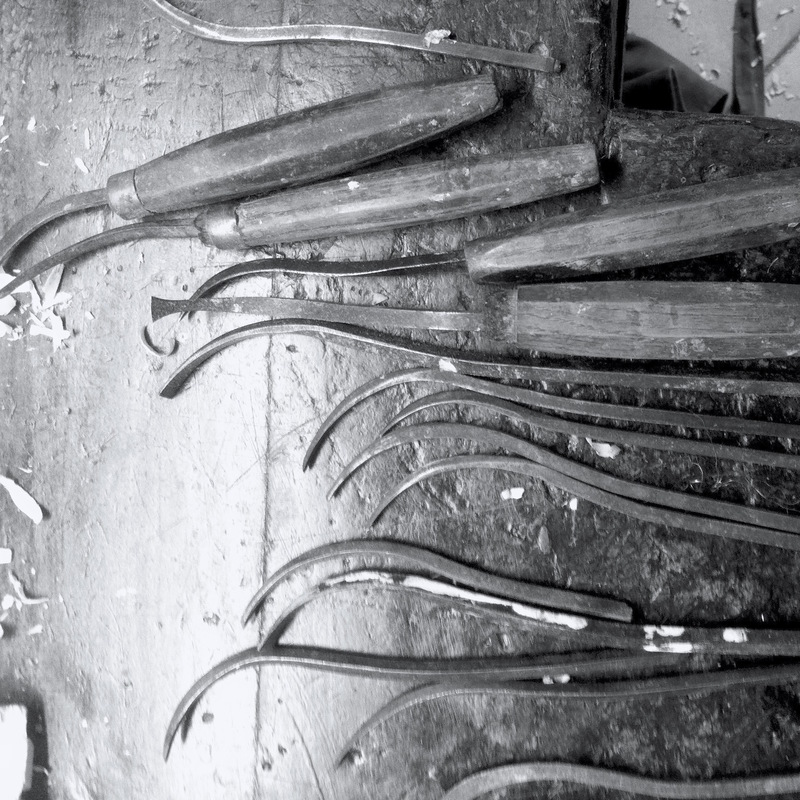 We dedicate ourselves to restoring frames to their original brilliance. We are passionate about frames. 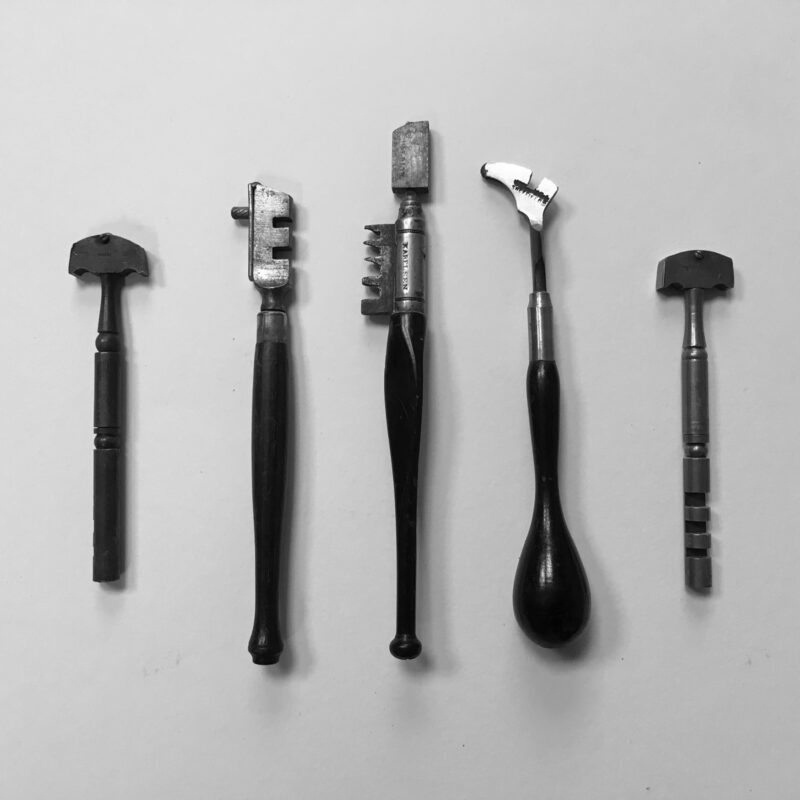 We have extensive knowledge in Australian frame history, frame making, value and restoration and can offer invaluable advice about restoring frames. We source and deal in antique frames upon request, and we can provide research-based insight into your collection of frames. 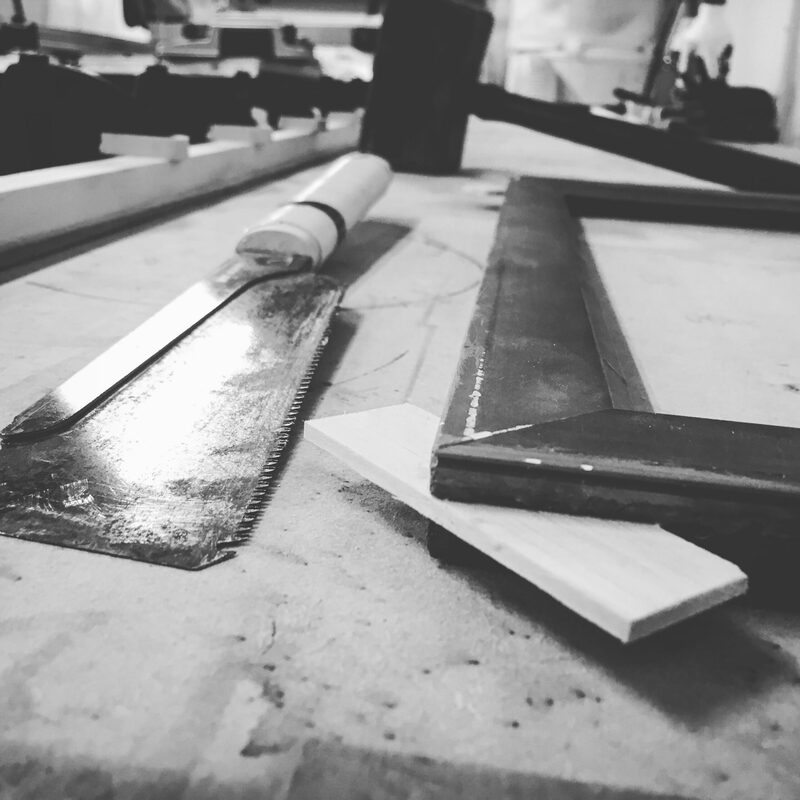 We believe that frames, no matter the monetary value, history or frame maker, should be cared for and protected to the best extent possible. We simply and unequivocally love frames. We have been working with, making and collecting frames for nearly a decade, and we have collectively worked on and restored hundreds of frames. We believe that the history of art should incorporate a focus on the history of picture frames, which undoubtedly play a role in the public and private artistic realm of expression and function. We strive to restore and protect Australia’s collection of frames, wherever the origin, whoever the maker and whatever the value, and we pride ourselves on our ability to offer restoration services that are based on best practice approaches, reversible techniques and traditional methodology. Above: A large ornamental composition frame undergoing extensive repair. This frame presented with significant loss and damage to the ornamentation on all areas of the frame and large areas of the netting underneath the ornamentation was also damaged. Custom moulds were taken and new ornamentation was made using traditional techniques and recipes. Some areas of netting were replaced entirely while others were repaired and stabilised. Over 800 ornament repairs were made on this frame that is now hanging around a valuable antique Australian artwork in Ipswich. Above: This frame presented with significant damage to the corner ornaments and the running decorative ornamentation and the original finish has been over-painted with a heavy bronze paint. Left: The bronze paint has been removed from the frame and gesso repairs are being made to consolidated ornamentation. Middle: The frame’s original finish was significantly damaged and the gilding that remained was heavily tarnished and thin, therefor new layers of clay bole were applied in the same manner that was used underneath the original gilding of this frame. Right: The highlights of the frame have been water-gilt in 23K gold leaf and burnished to a high sheen. The remainder of the frame will be oil-gilt in 23K gold leaf. Above: The restored frame. The oil and water-gilding have been sealed and extensively toned to suit the artwork and the client’s preferences. Above: A and very delicate gesso inciso frame in its presenting condition. There are over 50 areas of damaged and chipped gesso on the face of this frame The frame was originally water-gilt in silver, however age has worn away the silver and the clay-bole underneath is now revealed. In agreeance with the client, it was decided that the frame would not be re-gilded. Above: The completed frame restoration. The fragile gesso layers have been consolidated with conservation grade materials and the new gesso inciso has been carefully re-carved to complete the pattern. Traditional clay bole has been used to blend all the repairs to blend-in seamlessly with the original finish. Above: A medium-sized ornamental oval frame completely over-painted with various mediums, with cracks and missing ornamentation before restoration. Above: The frame after the completed restoration. The paint has been removed, the cracks stabilised and repaired and the ornaments fixed and blended in. The frame has been re-gilded in 23K gold leaf using both water and oil-gilding techniques as the original finish was badly damaged by the paint and could not be salvaged. Above: A large ornamental, gold mirror frame with multiple areas of ornament, gesso and gilding damage. Above: Images of the frame during the restoration process- showing repairs being made to ornaments and cracks on the frame and showing the burnishing of new 23K gold leaf water-gilded repairs with an agate burnisher. Above: The frame after restoration with repaired ornamentation and gilding. 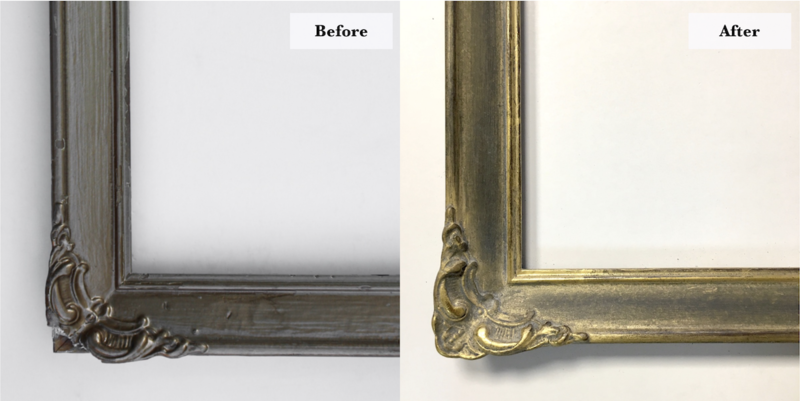 The new areas of 23K gold leaf water-gilding have been toned and antiqued to match the existing antique patina of the frame. Above: The before and after images of the repaired frame. The frame presented with a heavy over-painted finish and damaged ornamentation. 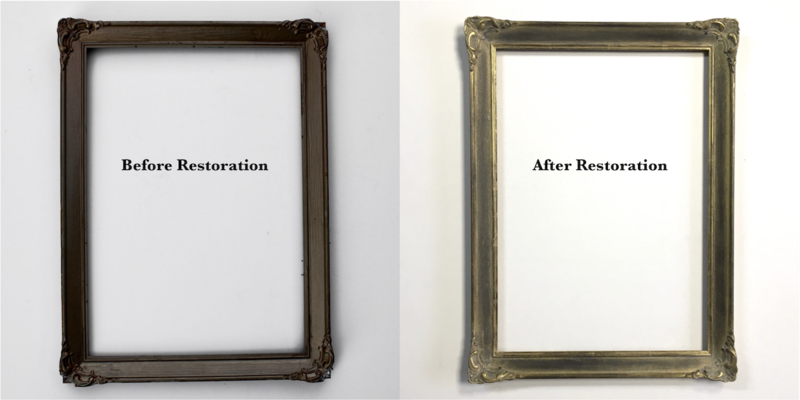 The paint was removed and repairs were made, and the frame was water-gilded in 23K gold leaf and antiqued to match the artwork and to meet the client’s preferences. Above: Corner details of the before and after images of the repaired frame. All Images and Content Copyright Rich & Davis 2018.